Fall is already off to such a busy start that I’ve barely had time to cook anything for this site. My lunches have been all about scrounging from the refrigerator and eating at my desk or standing at the counter shoveling food in my mouth straight from a quart container. Luckily, I’ve had so much recipe testing for Food & Wine these past few weeks that my fridge has been well-endowed in the leftovers department. This particular lunch came by way of some scraps from my fish tacos project with a few toppings borrowed from the Pad Thai I was currently shooting on that particular day. And it was consumed in an effort to hop back on the Meatless Monday bandwagon after a weekend of eating 70 percent of my meals in the form of red meat at camp. 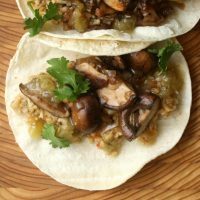 Ever since I ate at Rick Bayless’ restaurant in LA back in February, I’ve been wanting to develop a recipe for mushroom tacos. Texturally, they’re the best option for a vegetarian filling, and they carry so much flavor when seared over high heat that you don’t need to do a whole lot to them. I generally like any vehicle that can subject itself to the whorehouse of condiments that is my fridge. 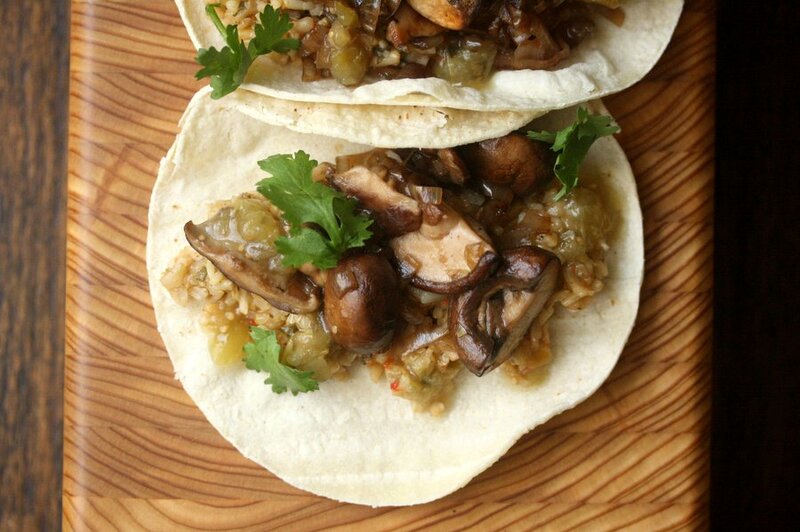 And these mushrooms cozied up nicely to some leftover tomatillo salsa and just a few drops of sriracha. In an effort to make my leftovers lunches even better, I’ve started making a big pot of rice at the beginning of the week. This summer I got hooked on this brown basmati version of traditional Mexican rice. For a dinner party, I made something similar and mixed in a little marinated kale and scallions before serving to make the green rice even greener. I’m excited to start experimenting with some more fall veggies in the weeks to come. Are there any in particular that you’d like to see? Any dishes you’ve been craving recipes for this season? Let me know if the comments! I promise that you too won’t be forced to eat my leftovers for lunch. In a medium lidded saucepan or Dutch oven heat the oil. Saute the shallot, pepper, and jalapeno over medium-high heat until soft, about 3 minutes. Stir in the rice and cilantro. Salute another 2 minutes, until the rice is covered in the pepper mixture. Add 2 cups water and bring to a boil. Cover, turn the heat to low, and cook 45 minutes, or until the brown rice is soft and the water is absorbed. Rest for 10 minutes, then fluff with a fork. Meanwhile, in a large skillet, heat the remaining oil. Saute the shallots and mushrooms over high heat until the mushrooms are nicely browned, about 5 minutes. 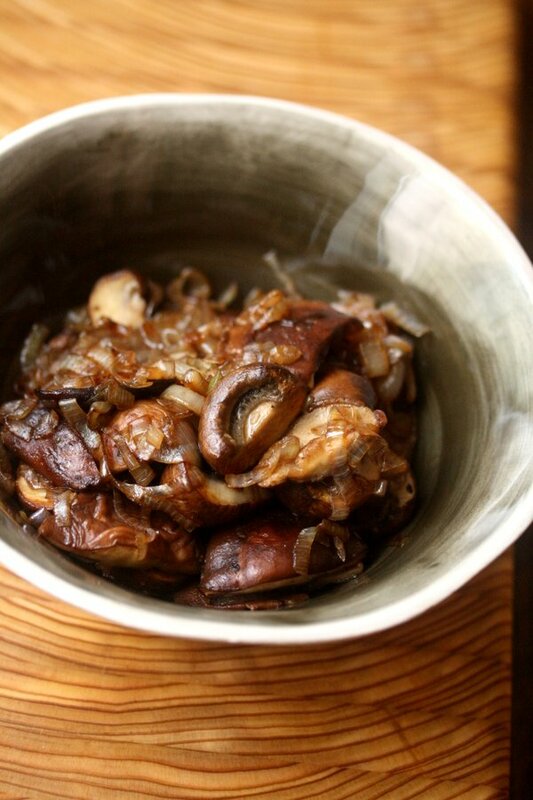 Add the salt and continue to sauté until the mushrooms have released all their moisture, about 3 minutes more. Set aside. Divide the rice among the tortillas and top with the mushroom mixture. Garnish with cilantro leaves and serve alongside the tomatillo salsa. Love these tacos! Leftovers aren’t so bad when they look like this. 🙂 And I was going to comment on that gorgeous board, too – it’s lovely! You are so lucky to be doing all this work with Food & Wine! Jealous! Can’t wait to see the finished products! I just recently jumped on the Meatless Monday bandwagon, I love it! It is so cheap and easy! 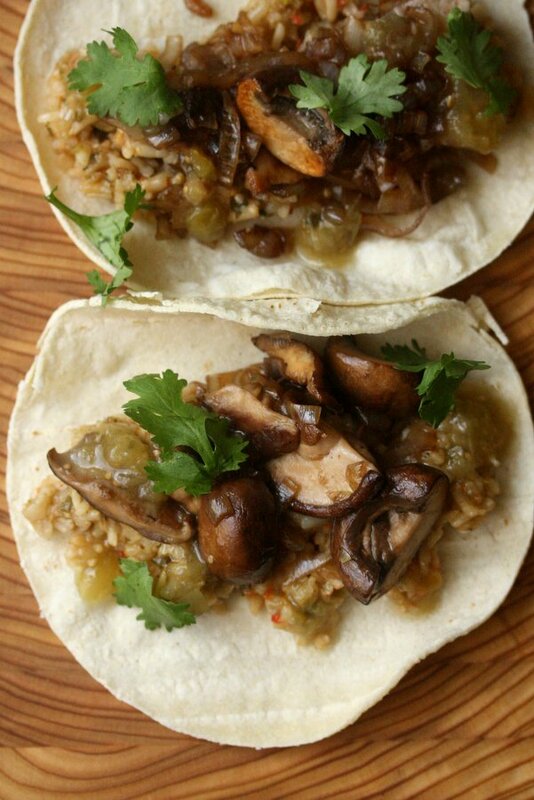 Also, I just recently had a mushroom taco to die for that sounds very similar to this so I cannot wait to recreate this at home! Can you do something with rutabagas in a recipe this fall? It’s just one of those mystery veggies that I notice in the store and then realize I have no idea what they’re good for. These sound so flavourful! 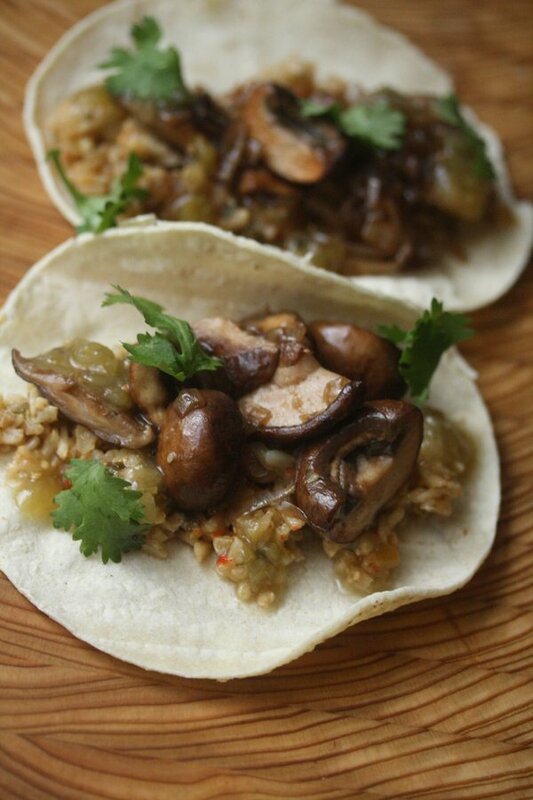 Mushroom tacos are always a favourite and I’ll be sure to try your recipe… thanks for sharing! These look so hearty and festively fall! I’d love to see something related to squash. Pumpkin tacos to go with the pumpkin hashtag nonsense trends that pop up everywhere (and we all secretly love it.) Pumpkin sauce? Pumpkin tamales? Hello from Downunder and thank you for a great recipe. 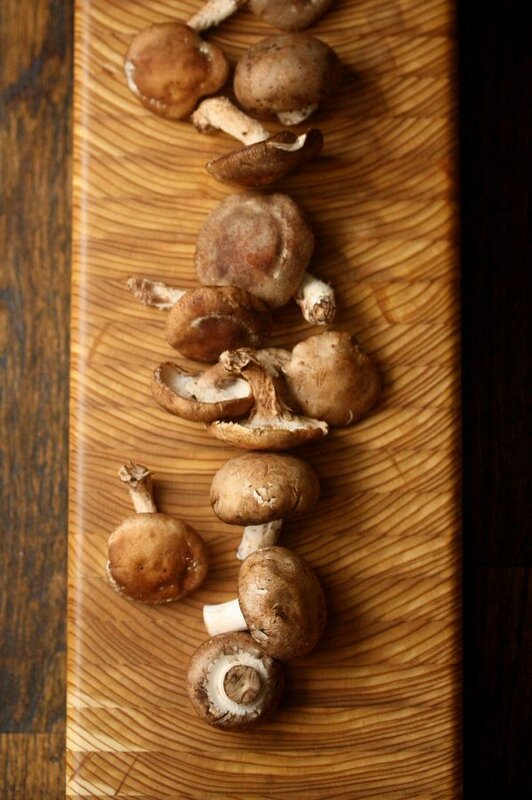 I always keep mushrooms on my shopping list and I love what you’ve done with them here. Ok, YES. I just made and devoured these, and they were SO good! I like to go crazy with the extras, so i added warmed refried beans (with some thyme), avocado, and queso fresco. Love! The “filling” was delicious–and in fact, I never even had a chance to put these into tacos. But by itself, the rice/mushroom combo with a little bit of salsa was a pretty nice snack/side. Great recipe, and very easy to do. woohoo!! good to know that the tortilla is “optional” – thanks for making! Instruction 1 Sentence 3 Stir in rice & cilantro. Saute another minutes, until the rice is covered in the pepper mixture.